I absolutely adore cookbooks, but I've not read much fiction centred around food, apart from Joanne Harris's Chocolat. That Part Was True is a love story, but it's also a book about food and the role it plays in our lives - providing us with sanctuary and comfort, or being something we use in the process of celebrating or consoling. And of course, food brings us together. From her home in England Eve Petworth writes to author Jackson Cooper in America to praise a scene in one of his books. The two strike up a friendship through their letters, desperately needed as they each try to navigate their own lives. 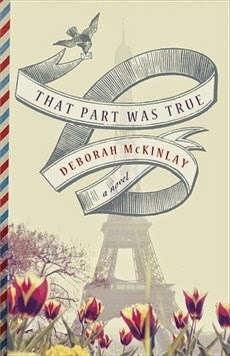 In That Part Was True, McKinlay weaves a gentle, absorbing love story nestled in amongst a family drama and a buddy story. Eve and Jack's stories are two separate, barely intertwining plots, apart from the letters between the two. I was expecting something pretty conventional, with McKinlay bringing the protagonists together fairly quickly, but instead she gives them room to grow on their own, aided by the letters they send to each other. Eve is shy, the product of a lifetime living with a mother who was overbearing to the point that she brought up Eve's daughter Izzy. Now that her mother is dead, Eve finds herself negotiating motherhood in a way she hasn't before, as Izzy prepares to get married. Meanwhile Jack is a successful author who has just split up with his wife and is dating again at the behest of his best friend Dex, an actor. Eve and Jack couldn't be more different if they tried, but somehow McKinlay makes them seem like they belong together. And that's partially through the food, which forms the main subject of their letters. That Part Was True is dotted with recipes which are full of love and care and which have played a significant role in Eve and Jack's lives. Gentle though it may be, That Part Was True is also bittersweet. Eve and Jack's relationship isn't perfect, and there is much in each character's life which holds them back. It's a book that, despite being just over a couple of hundred pages long, manages to pack in a lot of depth, just like a good meal. How I got this book: From the publisher, Orion. This did not affect my review. It was a lovely read, I hope you enjoy it.